Whose bright idea was it to lable horizontal images “landscape,” and vertical images to be “portrait”? To them, let me just say: “Huh?” As a landscape-only photographer, about half of my images use “portrait” orientation. Sometimes I wonder if this unfounded naming bias explains why so many people default to a horizontal orientation for their landscape images, missing some great opportunities to improve their photography in the process. Every image contains implicit visual motion that’s independent of the eyes’ movement between the image’s compositional elements. Horizontal or vertical, the eye tends to move along the frame’s long side, a reality that allows photographers to complement the eye’s movement among the frame’s compositional elements (for example, a vertically oriented waterfall image), or to create tension by contrasting the elements’ visual motion with the frame’s long border (for example, a horizontally oriented waterfall image). Vertical images can also enhance the illusion of depth so important in a two-dimensional photo, because the natural tendency to follow the long side of an image enhances the front-to-back eye movement so essential to the sense of depth. More than just guiding eye movement through the frame, vertical orientation also narrows the frame, essential when we need to eliminate less compelling objects to the left and right of the prime subject(s). I use this approach quite a bit at Yosemite’s Tunnel View, where I think photographers generally tend to compose too wide (more on this below). 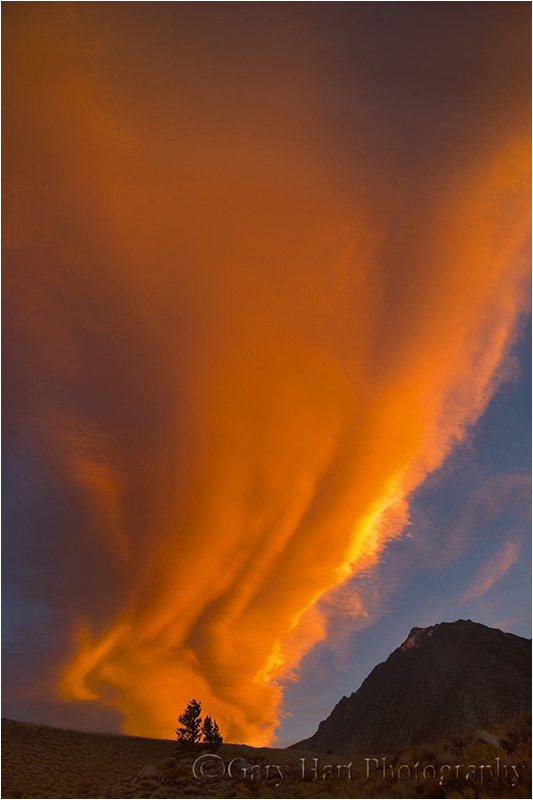 This image is entirely about the amazing cloud illuminated by Eastern Sierra sunset light. To capture it I found a single tree atop a ridge for the bottom of the frame, oriented the frame vertically, and gave the cloud over 80 percent of the frame. A horizontal orientation that captured this much of the cloud would have introduced distractions on the right and left, and shrunk the cloud significantly. A vertical orientation is a great way to emphasize something dramatic in the close foreground, distant background, or sky. I love showing off a beautiful sky by placing the horizon at the bottom of a vertical frame; conversely, I can focus most of the attention on a compelling foreground by placing the horizon at the top of a vertical frame. The more dramatic the element I want to emphasize, the more room I’ll give it by placing the horizon line closer to the top or bottom of the frame. Despite all these reasons to do otherwise, why do so many photographers default to a horizontal orientation of a landscape image? I think it starts with the subconscious need to maintain harmony with the horizontal orientation of the horizon, a bias that starts the first time we put a camera to our eye. It doesn’t help that the placement of the shutter button only encourages this behavior–on most cameras it’s just easier to snap a picture when they’re oriented horizontally. But I’m afraid the horizontal bias carries over to landscape photographers on a tripod, using a remote shutter release. In this case, in addition to the built-in horizontal-horizon bias, I blame the awkward maneuvering a vertical orientation on a tripod requires–it’s just easier to have your camera sitting right there in the center of the tripod at it’s highest possible elevation. Tilting the camera to vertical drops the eyepiece several inches, forcing the photographer to either stoop or lower the tripod to compose. It’s also destabilizing to position the camera away from the tripod’s center of gravity; some poor-quality tripod heads simply can’t handle the weight of a camera and lens that’s not directly atop the head. What’s a photographer to do? If you’re really committed to landscape photography, I can think of no single piece of equipment that will improve your experience in the field more than an L-plate. For less than $200, you can purchase an L-shaped plate that attaches to your camera’s base and wraps around one side. The plate is camera-specific (a new camera requires a new L-plate); it attaches to a corresponding quick-release plate on your tripod’s head. Switching between horizontal and vertical is a simple matter of disengaging the quick-release, flipping the camera, and re-engaging the quick-release. Not only is this quite simple and fast, it keeps the camera over the tripod’s center of gravity and the eyepiece always at the same level, regardless of orientation. The above image from Tunnel View was one of many (duh) I captured that March evening several years ago. I’d waited in a blizzard for two hours, hoping (praying?) for something just like this. When the light appeared just a few minutes before sunset, it was clear that the most compelling aspects of the scene (besides the always compelling El Capitan, Half Dome (lurking in the clouds in the top-center of the frame), Cathedral Rocks, and Bridalveil Fall was absolutely not the granite cliffs left of El Capitan and right of Cathedral Rocks; it was the clouds swirling above Yosemite Valley, the amazing light, and (especially) the snow-laden trees in the foreground. Going with a vertical orientation seemed like a no-brainer, as it allowed me to capture only the scene’s most beautiful elements, emphasize the foreground trees with a high horizon, and guide my viewers’ eyes through the scene, from the magical trees to Yosemite’s iconic landmarks. One unrelated note about today’s image: This is where I met my good friend and fellow pro photographer, Don Smith. Don and I were two of four or five photographers to brave the elements, with no guarantee of success, that chilly afternoon. Because at that time there was room for no more than five tripods in the prime (unobstructed by trees) Tunnel View viewing spot, photographers had to claim and hold their space rather than simply wait in the car for the weather to clear. Over the couple of hours we waited for the storm to clear, Don and I got chatting and a life-long friendship was born. See, you never know what you’ll find when you go out in crazy weather. Star Trails Above the Colorado River, Desert View, Grand Canyon: Here’s a 30 minute exposure toward the North Star. Notice how little movement the North Star shows compared to the stars toward the edge of the frame. Your end-note is a great example of patience… also something that might be as rare as turning the camera on its side for great shots like this. It’s obviously a bit less comfortable to shoot vertical, but as a photojournalist who likes to moonlight in landscapes I’m a bit more used to turning my camera on its side. I’m enjoying your perspective (okay, that’s a pun!) on photography in this blog. Thanks for taking us on a tour of your photographic thought process. Beautiful as always. I love to look at your pictures.